A great looking bar stool that is ideal for any member of the family to sit on while eating their breakfast at a bar area. The stylish crescent shaped seat combined with the sleek steel base and stem make for a very attractive Bordeaux red bar stool that many will love. If you are looking for a more subtle tone in a bar stool, the Bordeaux red option is a lovely choice for adding a touch of class to any kitchen or breakfast area. 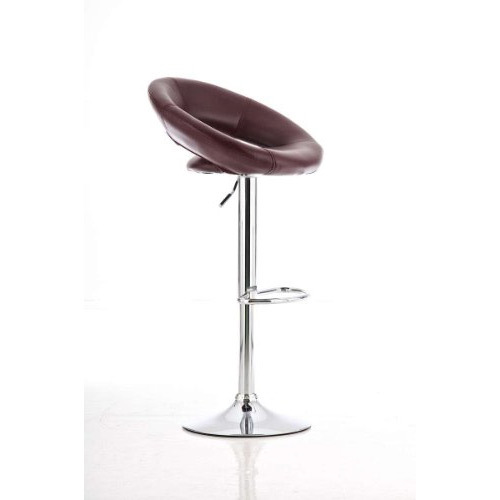 The crescent shaped seat of this Rio de Janeiro Bordeaux red bar stool is covered in coloured faux leather and according to those that have left ratings for this particular bar stool, the seat provides a very high level of comfort. The stool is height adjustable thanks to the lever situated underneath the stools seat area and the chrome circular base provides a stable and stylish looking support to complement the synthetic leather padded seat. As with many of the CLP bar stools available to purchase through our site, the Rio de Janeiro bar stool is of a very high quality and features everything you could wish for in a kitchen bar stool. To view a wider range of bar stools not only from the CLP range, but also from other top quality brands take a look at our bar stools and kitchen chairs category. Within this category you will find more great examples of some modern or retro looking breakfast bar stools, perfect for anyone wishing to add some more colour to their kitchen environment.